Notes: An interesting distillery with a very interesting series of vodkas in their portfolio. They actually call it Polugar (bread wine), but for the sake of simplicity in our reviews we are going to classify it as a vodka (never mind the fact no one would search for bread wine as a category of spirit). Bread wine is actually a more accurate description in some ways than vodka to describe the older more traditional form of vodka, much in the same way that Genever /Jenever forms of gin use the distinction of Vieux Systeme (using pot sills and lower proof distillation to retain flavor) to the new column stills distillation methods use more widely today which yields products with less character. The distillery itself is built along historic lines, using 18th and 19th century drawings to recreate their still – copper pot stills that look more like a cognac charentais or alembic type still or some of the older stills used for other spirits of that period . Here is one of the few pictures of their stills. The preparation of ingredients uses traditional wash and malting of grains and nothing else. The water is also not some Reverse Osmosis/filtered to death, fear of flavor water but natural spring water. The vodka is clarified using fresh egg whites and then filtered through birch charcoal – something that only the most prestigious forms of vodka do. The Rodoinov & Sons Distillery Boast an extensive portfolio of Vodka/Polugar/Bread Wine including this example from their flavored varieties their Honey and Allspice, Wheat, the Rye & Wheat, Classic Rye, the Single Malt Rye and the other flavored varieties Caraway, Dry Cherry, Juniper, Horseradish, Pepper, Honey and Allspice, and Garlic and Pepper. First Impression: Interesting, somewhat understated bouquet a well balanced blend of allspice,honey and thankfully just hints of pepper all carried nicely by the spirits which imparts a nice grain base linnet round out the overall bouquet. Taste: Nicely oily entry that smooths the way for the aromatic allspice,followed on by the honey and finally a pleasant heat from the pepper, which then leads to a nice grain finish with sweetness a whiff of perfume, heat, oiliness and plumpness. Just the way we like them. Drinks: Makes for a wonderful cocktail ingredient, as a vodka martini, an outstanding Bloody Mary, or a host of other cocktails where you want sweet, heat, a touch or aromatics and an oily graininess – which to me includes a LOT of cocktails ! Can’t wait to play with this one some more ! Bottle: Clear cylindrical bottle with a tall neck and a Honey colored neck capsule with gold lettering on the vertical with an attractive light honey colored label with antique fonts with a raised copper metallic “P”at the top of the label with a drawing of the ingredients – a comb of honey, an allspice berry and a hot pepper. A synthetic cork provides a good tight seal but easy to remove. 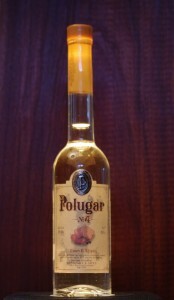 Other: Unlike a lot of other flavored vodkas (usually at 70 proof or 35 % alcohol ) Polugar keeps their original proof strength of 77 % (38.5%) so you are actually not paying for more watered down vodka. Final Thoughts: Delicious, balanced, full of flavor and body, this is an outstanding flavored vodka. Standard rather than watered down proof make mixing easier and helps mediate the somewhat higher price for this excellent vodka. Stick a fork in that Avian Fashion Victim Flavored Vodka and give it to the homeless under the bridge .